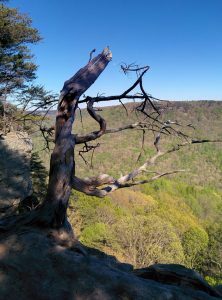 While on a recent hike, I saw an old tree clinging to a cliff. Really it was the remains of a tree, since it had obviously died some time ago. At first I was inspired by the beauty, then I thought about the fact that it was just the remains of a dead tree. The issue wasn’t really the tree, it was the location. Had the tree lived and died somewhere else, leaving such a scrawny carcass of a tree, it would have been underwhelming for sure. The real splendor of this little tree was not the beauty of its withered remains, but the testimony of those lifeless crooked limbs. A weathered wooden testament of a life lived in a difficult place. A life lived where cold winds whipped over a rugged landscape. A life lived where every ounce of growth had to be carefully rationed between leaves reaching for the sun and roots clinging to any small crack or crevice in the rock. If this dead tree had been somewhere in the middle of the forest, I would most likely have never noticed it, but having grown in the rugged, difficult place, it left a legacy of beauty. The Bible says that trials make us better people. I’m sure it’s true, even though if given the choice, I would prefer not to grow on the difficult, rocky cliff.